Background: The association between Parkinson’s disease and lifestyle exposures such as smoking, coffee and alcohol consumption have been the focus of research for several decades, with varying and often conflicting results. 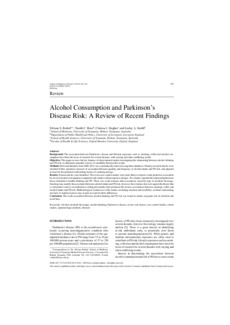 Objective: This paper reviews the key features of observational studies investigating the relationship between alcohol drinking and PD risk, to determine potential sources of variability between the results. Methods: Relevant literature from 2000–2014 was systematically retrieved using three databases. Primary research articles were included if they reported a measure of association between quantity and frequency of alcohol intake and PD risk, and adjusted at least for the potential confounding factors of smoking and age. Results: Sixteen articles were identified. The seven case-control studies were more likely to report a weak protective association by level of alcohol consumption compared to the studies with prospective designs. Two studies reported the relationship between heavy (harmful to health) drinking and PD. There was weak evidence that associations varied by type of alcoholic beverage. Smoking may modify the association between alcohol intake and PD risk, however, the evidence does not support the theory that a confounder (such as an addiction-avoiding personality trait) produced the inverse associations between smoking, coffee and alcohol intake and PD risk. Methodological weaknesses of the studies, including selection and recall bias, residual confounding and lack of statistical power may in part account for their differences. Conclusion: The weak association between alcohol drinking and PD risk was found in studies at greater risk of selection and recall bias.